When you choose to sail with Glatt Kosher Cruises to the Balkans you may pick a tour with either one or two days spent in St. Petersburg. Either way, a shore excursion is an absolute must, because, regardless of how tight your time a is, anyone who declines the opportunity, deprives themselves of a slice of history. The city is unique in being the only one unharmed during the Stalin era, and has been completely restored to its former glory from any damage done during WW II. 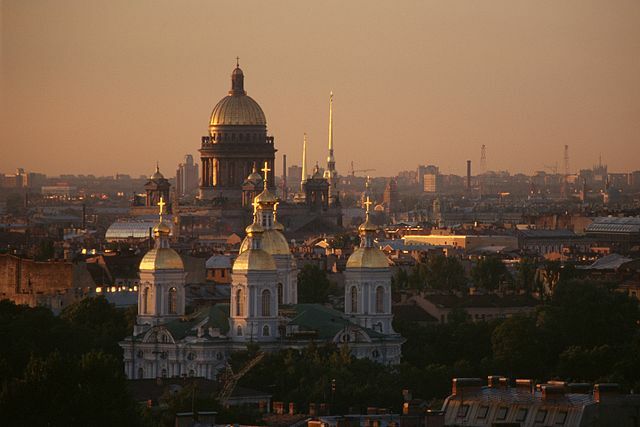 St. Petersburg, despite having gone thru the Bolshevik rule and for a while renamed Leningrad, is a living monument to a bygone era, great culture, and magnificent, unique beauty. St. Petersburg has a magnificently haunting air. The second largest city in Russia, the Imperial Capital and the seat of all royalty, is a city of such magnificence, that missing out on experiencing it, even if just on guided tour bus, will wet the appetite of any traveler with its graceful grandeur which will remain unforgettable. I’m amazed to have been fortunate enough to visit this majestic city several times, and two of those were shore excursions on a tour of the Baltic. I think my very first time setting eyes on St. Petersburg, deserves a mention too. I arrived by boat, having just come from Scandinavia with its massively practical and minimalistic interiors, as simple and unadorned modern as can be. With the exception of Tallinn, which was a marriage of Medieval buildings with a strong presence of the 21st century in places, and the Royal Palaces in Copenhagen, even the buildings in most places were a charming, yet simple background to the magnificent Nature untouched by human hand. The words practical, modern simplicity would describe best, both the art and architecture in Scandinavia. Then directly from the crystalline coasts of Finland, our boat made a single day stop in St Petersburg. Since we had very limited time in Russia, I made sure to buy tickets weeks ahead online at the Kirov Ballet site. I planned it all very tightly; off the boat after an early lunch, then a cab to the 11:30 am performance of the Kirov Ballet’s ‘Cinderella.at the Miriinsky Theatre. The performance was beyond wondrous, I still remember the moves, the perfection and passion of the dancers. It was an incredible experience to be had! Nijinsky, Nureyev, Barishnikov and Pavlova are just a few of my heroes who originated from this company. And my choreographer idol, George Balanchine, began his career in the Kirov, before creating a new standard of perfection at the New York City ballet. The level of artistry I witnessed is beyond anything that can be seen in other countries, at least with such consistency. Still in a daze and the music playing in my head, I hurried directly after the performance to the pre-booked tour bus (with an English speaking, knowledgeable guide) and went about to having a quick taste of the city’s highlights. We drove around town, looking at fantastic buildings, a treasure trove of architectural gems, palaces and administrative buildings, some painted a pastel green or pink, spanning three centuries and a variety of trends and styles. I thought for a moment of the McMansions one sees in the USA, especially when the guide pointed out private mansions of great beauty. We saw exquisite monuments and the stories about them, wow, so much history! Then, from a distance I saw the magnificent river bound Winter Palace. It stretched beside the water, glistening and regal, and very, very long. I was transported to an era of Imperial splendor, built for the Romanoff’s, and before I even set foot in my beloved Winter Palace, I noted that this was one of the worlds most beautiful and most interesting cities. The moment we entered the Palace at the western entrance, we came upon the famous motorized bird clock, gigantic and magical, at the chandelier room. Despite the fact that and every moment was pre-planned, adhering to a short time schedule, I found time to see some pieces of art I’ve been longing to see in real life, walked around with tears of joy, and felt grateful to be alive. I was transported to an era which exists no longer, but somehow, feels very familiar and almost like home. The tour was very concise, with the short intervals of free times for wandering around the Winter Palace, or shopping for Russian Babushkas (painted wooden dolls of many sizes, starting with a miniscule one which fits perfectly into a slightly larger one, etc. loads of fun, even just to play with them. It goes up to a very large doll, containing over 20 smaller ones, if you wish to spend the money at the museums store. I also bought a copy of a Faberge egg, stunningly replicated, and the secret latch on it opens to show the Tsar Nikolai, Alexandra and the children, which was bought from the amazing jeweler as a gift for Alexandra’s birthday by her very loving husband, The same bejeweled egg could be gotten for less at the open market at, but somehow I felt mine was more authentic, with it’s brilliantly elegant wrapping and golden box, and the insert elaborated on the whole story. I’ve been back twice since and I keep discovering more each time, including a visit to the opera (those Russian voices can do things to your soul), and since I have 2 sisters who are friends I was invited to show my artwork there because the older sister is the program director of one of the 90 museums in the city. The only thing that stopped me to jump on the opportunity is that I have to pay to transport the works, but since lodging and food are provided, I might just take my pieces off their canvases, roll them up and sail back to St. Petersburg. This entry was posted in Cruise Tips, Travel Experiences and tagged Kosher Cruise, Kosherica, St. Petersburg on May 29, 2014 by slAdmin.